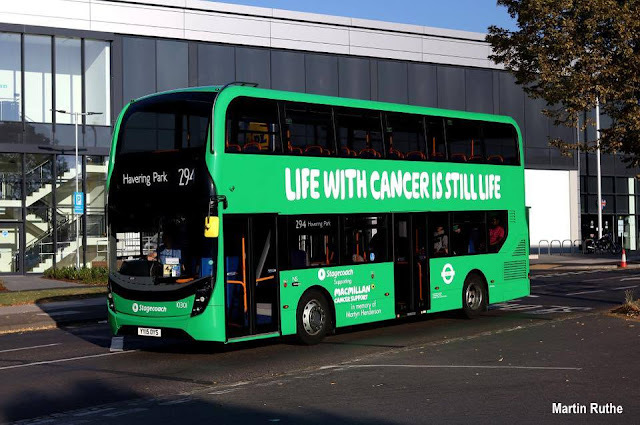 Bright green 86 bus running from Romford to Stratford unveiled in honour of ‘much-loved’ driver who died of cancer. The Stagecoach bus, sponsored by Macmillan Cancer Support, has been rebranded in honour of former driver Martyn Henderson, who lost his own battle with cancer in July 2017 – it even bears his name in large lettering down the side of the vehicle. Martyn, who had become Assistant Garage Operations Manager at the Romford garage in North Street before he died, was supported throughout his treatment by the charity, and to commemorate his passing, Stagecoach and Macmillan have announced a new £50,000 partnership over the next two years. The bus, which is just a small part of a public awareness campaign the two organisations have planned, was unveiled at a special ceremony at the Romford depot on Monday, July 9. The emerald 86 bus will soon be seen travelling from Romford through Chadwell Heath to Ilford and then onto Stratford, and vice versa. Bill Daly, Romford Garage Operations Manager and close friend of Martyn Henderson, said: “Martyn worked for bus and coach companies for most of his career and for Stagecoach since 2008. “So, we are delighted to be honouring him in this way, with his own special bus. Martyn’s brother Brian also attended the unveiling ceremony with his wife Jean. 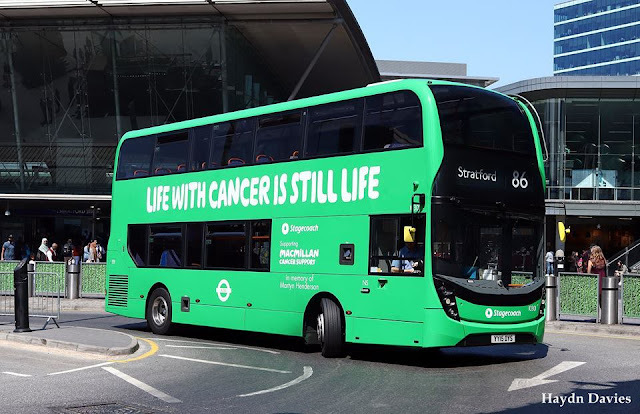 Carole Heffernan, Macmillan Area Fundraising Manager for London, added: “Every day, more than 90 Londoners hear the devastating news they have cancer – that’s enough people to fill a Number 86 bus. “And with that number set to possibly double by 2030, Macmillan Cancer Support will be needed more than ever to help people with cancer find their best way through. “This exciting new partnership with Stagecoach sees the launch of a Macmillan-branded bus commemorating a much-loved colleague, Martyn Henderson.